Can you still have a home if you don't have a house? Always think in threes and you'll never fall, Cora's father told her when she was a little girl. Two feet, one hand. Two hands, one foot. That was all Cora needed to know to climb the trees of Brooklyn. But now Cora is a middle schooler, a big sister, and homeless. Her mother is trying to hold the family together after her father's death, and Cora must look after her sister, Adare, who's just different, their mother insists. Quick to smile, Adare hates wearing shoes, rarely speaks, and appears untroubled by the question Cora can't help but ask: How will she find a place to call home? After their room at the shelter is ransacked, Cora's mother looks to an old friend for help, and Cora finally finds what she has been looking for: Ailanthus altissima, the "tree of heaven," which can grow in even the worst conditions. It sets her on a path to discover a deeper truth about where she really belongs. There are moments when we read a book that we know that we are going to immediately like the book. Sometimes it happens with just reading the first couple of chapters but for me it happened when just reading the first one. 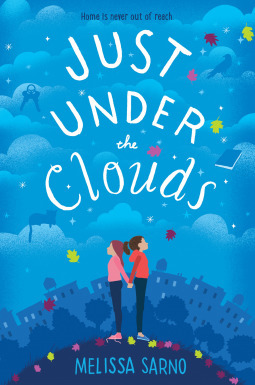 Just Under the Clouds is a tight packed novel with a complex story following one girls adventure as she sets out in finding herself while still managing to hold together her family. Cora is a character who grows on you. There a lot that is going on in her mind and the fact that she has to still find time to watch out for her sister. Throughout the novel we see various sides to her emotionally. We see sadness, we see anger, however, we also see happiness. We see that no matter how tough the day has proven family will always come first. This is a crucial novel for young people because it shows a family who is always on the move, living in poverty and are getting by. It gives a chance to show what some families go through and show us, the reader, to appreciate what we are given so that we can truly have a happy life. Melissa Sarno writes a beautiful debut novel that illustrates not worthy scenes. A story perfect for talking about empathy and the heartbreaking realities of families. A sensational read!